A coloring page or two can keep kids busy for quite a while, giving parents a little bit of silence and peace. Some parents prefer to hand their kids a nice coloring book or a fun little coloring page that they printed off of the Internet. Not me, though! No…that’s just not how I roll. Now, if I was a nice mama, I could just give them a plain old coloring page and call it a day. Or, I could give them a regular blivet coloring page, but they’d figure that out in a second! But, hand them a coloring page with a hidden blivet in the columns…? That oughta do it! They’ll be sitting there forever trying to figure out what’s wrong with the picture and how to make the columns and background match up. Guess what, kid… Never gonna happen, so good luck! I swear I’m not a mean mama. I just like to make my little darlings think every once in a while. And, they love a good optical illusion as much as I do, so when they found it, they’d appreciate it. They’d also make it their own personal mission to make the columns in this optical illusion coloring page match up with the hallway. Bless their little hearts. I wonder if they’d notice the “Optometrist” sign and get the irony, though. 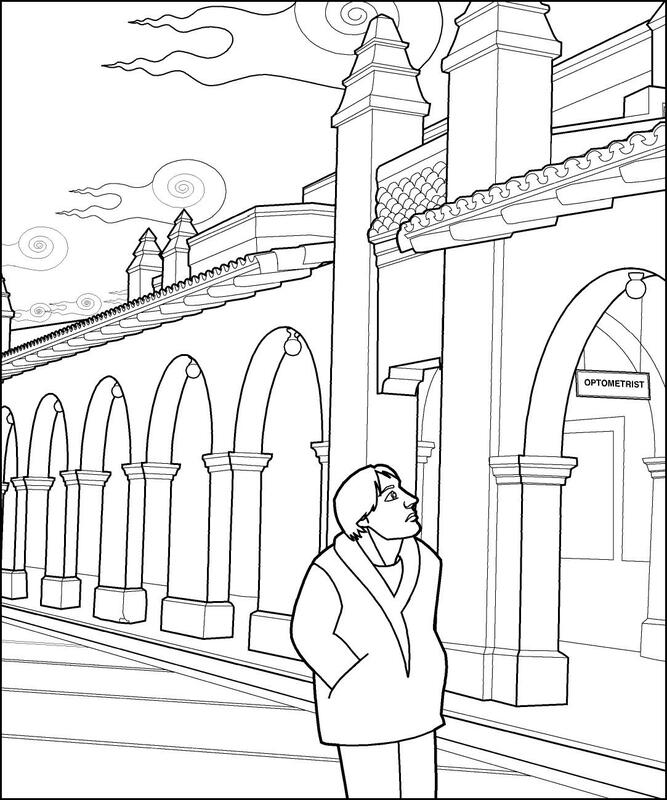 If you want to print this coloring page to baffle your own little cretins for a while, just click on the image. When it opens in a new tab, click on it again to zoom in, then print. Do let me know how it goes, from one evil parent to another! What do you think of this optical illusion coloring page? Would you give it to your kiddos? If you’re a blivet fan, make sure you check out the blivet collection too!